Black Holes (def. ): A dense, compact object whose gravitational pull is so strong that - within a certain distance of it - nothing can escape, not even light. If a star has three times or more the core mass of the Sun and collapses, it can form a black hole. These bizarre objects are found across the Universe -- within double star systems and at the centers of galaxies where giant black holes grow. X-ray telescopes like Chandra can see superheated matter that is swirling toward the event horizon of a black hole. Chandra has revealed how black holes impact their environments, how they behave, and their role in helping shape the evolution of the cosmos. A black hole does not have a surface in the usual sense of the word. There is simply a region, or boundary, in space around a black hole beyond which we cannot see. This boundary is called the event horizon. The radius of the event horizon (proportional to the mass) is very small, only 30 kilometers for a non-spinning black hole with the mass of 10 Suns. Anything that passes beyond the event horizon is doomed to be crushed as it descends ever deeper into the gravitational well of the black hole. No visible light, nor X-rays, nor any other form of electromagnetic radiation, nor any particle, no matter how energetic, can escape. Supermassive black holes with the mass of many millions of stars are thought to lie at the center of most large galaxies. The evidence comes from optical and radio observations which show a sharp rise in the velocities of stars or gas clouds orbiting the centers of galaxies. High orbital velocities mean that something massive is creating a powerful gravitational field which is accelerating the stars. 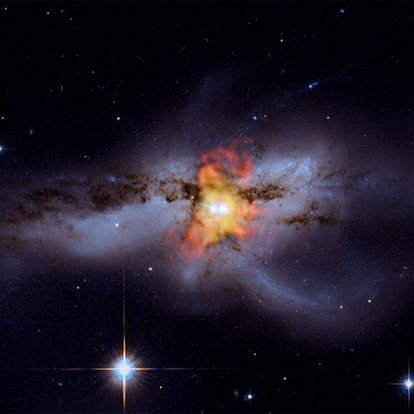 X-ray observations indicate that a large amount of energy is produced in the centers of many galaxies, presumably by the in-fall of matter into a black hole. accretion disk A disk of gas and dust that can accumulate around a center of gravitational attraction, such as a normal star, a white dwarf, neutron star, or black hole. As the gas spirals in due to friction, it becomes hot and emits radiation. event horizon Imaginary spherical surface surrounding a black hole, with radius equal to the Schwarzschild radius, within which no event can be seen heard, or known about by an outside observer. singularity A point in the universe where the density of matter and the gravitational field are infinite, as in the center of a black hole. relativistic jet A powerful jet of radiation and particles traveling close to the speed of light. 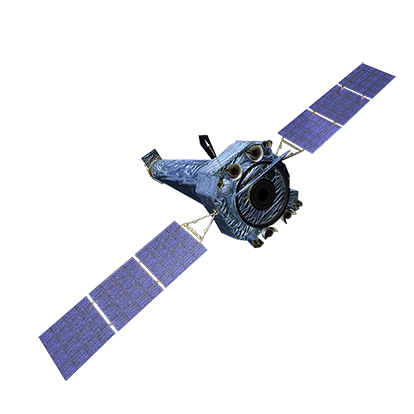 With its unique properties, Chandra is peerless as a black hole probe—both near and far. 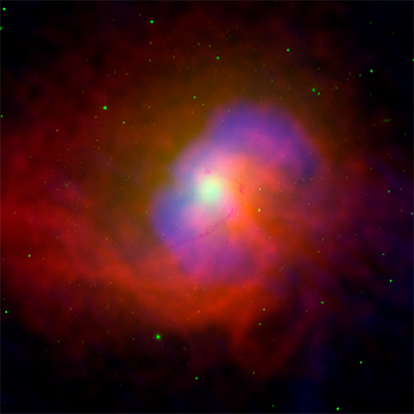 Chandra can’t “see” into black holes, but it can tackle many of their mysteries. Using Chandra, scientists have found evidence for mid-sized black holes, found hidden populations, and estimated how many black holes are in the Universe. They have studied their dining habits and how fast they spin. They found a black hole that generated the deepest note ever detected in the Universe, and another that generated the most powerful explosion. They found direct evidence for a star that was torn apart by a supermassive black hole. They observed two supermassive black holes orbiting in the same galaxy, destined for a titanic collision. 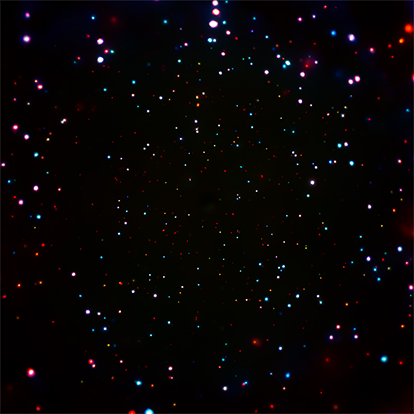 Chandra observations strongly confirmed the reality of the "event horizon". Expect more startling revelations about the lives of black holes as Chandra continues its mission to explore our Universe. How are black holes created? In general, black holes are created whenever enough matter is squeezed into a small enough space. To turn the Earth into a black hole, we would have to compress all its mass into a region the size of a marble! Stellar mass black holes are formed when a massive star (about 25 times the mass of our Sun) runs out of fuel and its core collapses. 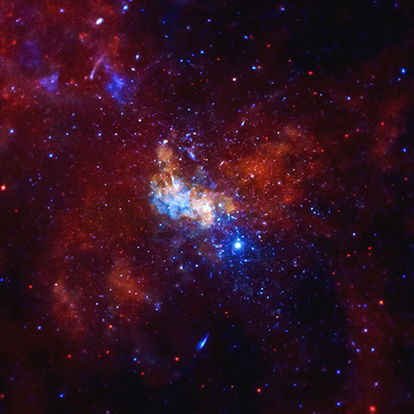 The formation of supermassive black holes is more mysterious. They may be created when stellar mass black holes merge and gobble up matter in their vicinity, or by the collapse of giant clouds of dust and gas. 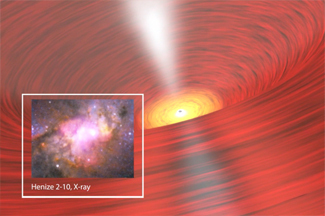 Can X-ray telescopes see a black hole? No light of any kind, including X-rays, can escape from inside the event horizon of a black hole. 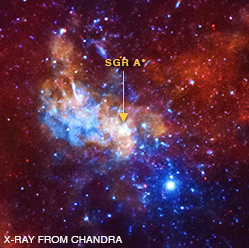 The X-rays Chandra observes from the vicinity of black holes are from matter that is close to the event horizon of black holes. 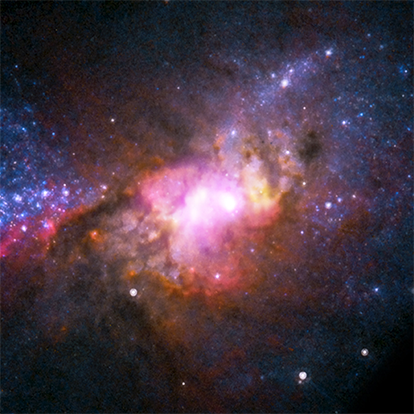 Matter is heated to millions of degrees as it is pulled toward the black hole, so it glows in X-rays. How do you find black holes with Chandra if you can't see them? Searching for black holes is a tricky business. One way to locate black holes is to search for the X-radiation from a disk of hot gas swirling toward a black hole. Friction between particles in the disk heats them to many millions of degrees, and they produce X-rays. Such disks have been found in binary star systems composed of a normal star in a close orbit around a stellar-mass black hole and, on a much larger scale, around the supermassive black holes in the centers of galaxies. What happens to objects when they get too close to a black hole? Objects can orbit a black hole without any serious consequences as long as the size of their orbit is much greater than the diameter of the event horizon of a black hole, which is about 30 kilometers for a stellar black hole, and many millions of kilometers for a supermassive black hole. But, if any object gets too close, its orbit will become unstable and the object will fall into the black hole. 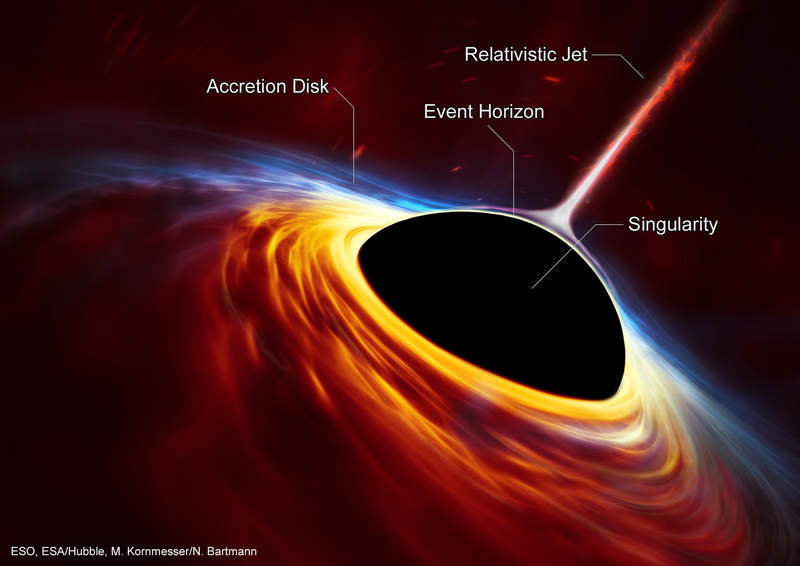 Is all matter in the disk around a black hole doomed to fall into the black hole? No, sometimes gas will escape as a hot wind that is blown away from the disk at high speeds. 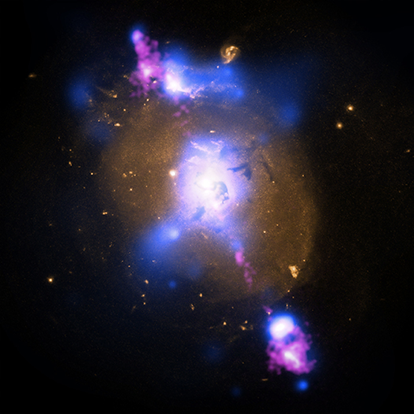 Even more dramatic are the high-energy jets that X-ray and radio observations show exploding away from the vicinity of some supermassive black holes. 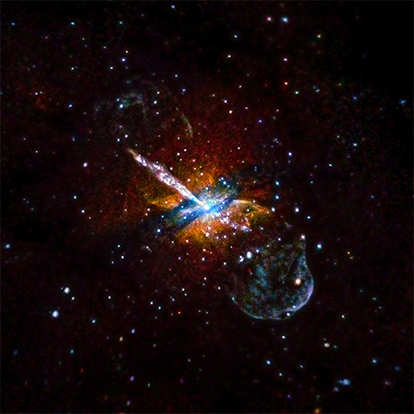 These jets can move at nearly the speed of light in tight beams and can travel hundreds of thousands of light years. Do black holes grow when matter falls into them? Yes, the mass of the black hole increases by the amount of mass that was captured. For a stellar-mass black hole the radius of the event horizon increases by about 3 kilometers for every solar mass that is captured. Are there limits to black hole growth? Theoretically, black holes can grow without limit. However, in the Universe, black holes do not have an infinite food supply! Sooner or later they will consume all the matter within their gravitational reach. 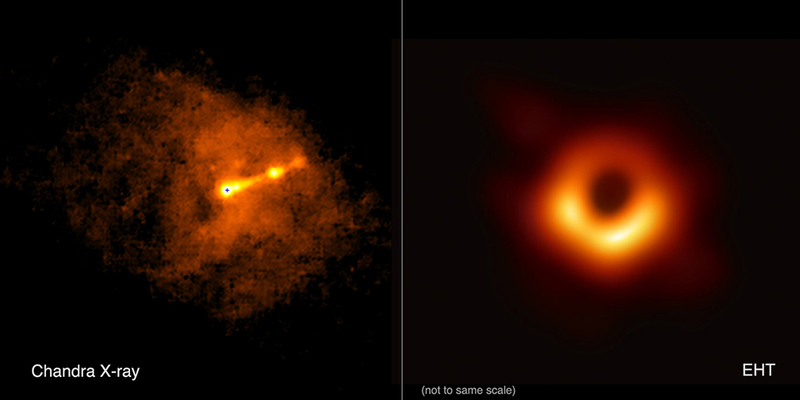 Material further away may be affected by the gravitational field of the black hole, as we on Earth are affected by the massive black hole in the center of the Milky Way, but will not fall past its event horizon. Can matter ever come back out of a black hole? No, even if matter was able to move at the speed of light, it could not escape once it falls past the event horizon. This is because the gravitational field inside a black hole is so strong that space is curved in on itself. Anything that falls into a black hole is able to travel in one direction only—towards the singularity (a point of infinite density where the laws of physics as we know them break down) at the center. Stephen Hawking showed that quantum theory implies that black holes should emit radiation. This radiation is predicted to be exceedingly weak and undetectable, except for hypothetical black holes with the mass less than that of a comet, and has yet to be observed.